Tips for harvesting onions from your vegetable garden. Also complete plans for planting onions, caring for onion plants, and how to store onions. At times avid gardeners take it for granted that everyone already knows the details of successful vegetable gardening practices such as planting onions. Recently, I was reminded that there are plenty of people who could use important information and helpful gardening tips to their advantage. As the holidays brings out more shoppers who do not cook huge family dinners on a regular basis, I overheard a young lady in the supermarket as she looked down at the long grocery list ask her Mom, "Aren't scallions just onions that haven't grown big yet?" Let's look at the basics for onions which includes other members of the Allium family such as leeks, garlic, chives, and shallots. The main goal of a home vegetable garden is to provide family, neighbors, and friends with a continual supply of delicious and healthy produce. Following well laid plans for harvesting makes achieving your goals much easier. 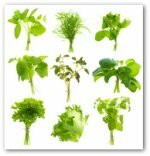 It is necessary to plan accordingly because vegetables have varying growing habits, seasons, and harvests. 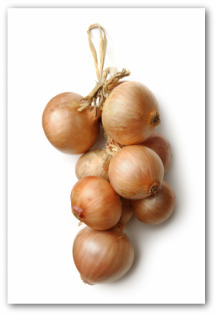 Since onion sets often contain bulbs of various sizes, they mature at different times over a period of weeks. Most garden vegetables such as drying onions are harvested at maturity. At about the time you are planting warm season vegetables in the garden, the first green onions should be ready to harvest. As green onions mature, they produce a series of crops. Green onions, bunching onions, and chive offer continuous harvests once they reached their desired size. When harvesting onions, pull green onions when bulbs are no more than ½ inch in diameter, wash them thoroughly, and refrigerate immediately. Bunching onions and chive form perennial colonies of pungent shoots, which may be harvested throughout the vegetable gardening season. Begin harvesting onions, garlic, and shallot in early summer. 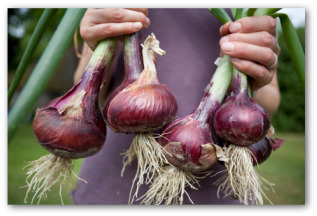 Harvest bunching varieties when bulb divisions reach 1-2 inches by splitting them off from outside of the bunch. 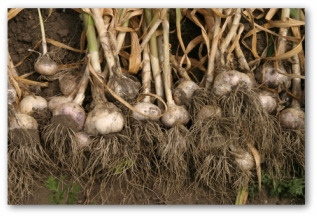 For mature bulbs, gather when tops brown and wither and bulb size is 3-5 inches. 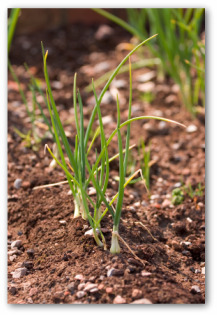 Onion, shallot, and garlic plants generally require lodging to prevent their green tops from forming seed heads as they dry. Bend the stalks to the ground several weeks before harvesting to limit further foliage development. This action redirects the plant's energy to root development and increases the flavor and size of the onions. When the onion tops have nearly dried, dig up a head or two to make certain the vegetables are fully developed. Onions and garlic may be stored in the soil for a few weeks. Shallots may be held in the ground for longer periods but are subject to damage in hard freezes. Choose a sunny dry day for harvesting onions. Hang the bulbs from their stalks in a warm dry location for about 10 days. The outer onion skin should turn papery. Then move the vegetables to a cool dry storage area or use immediately. Storing onions is really quite simple. After the onions have dried, the onions are ready for longer term storage. The dried onion tops can be braided together to store the onions, or the dried tops can be removed and the onions placed in a cool, dark, dry storage area to extend shelf life. During a radio contest, a question asked of the contestants was what food is most used around the world. Many of the callers suggested bread or rice. The correct answer was onions! Harvesting onions can be traced back thousands of years to Ancient Egypt. Throughout modern times, rural home vegetable gardening has enjoyed a tasteful as well as colorful history. In the not so distant past, suburban backyard plots became increasingly popular during war time. Community gardens in urban settings also saw a rise in popularity to meet an increasing demand for supplying fresh vegetables. Instructing young children in cultivation techniques such as growing and harvesting onions is a fun way to get them involved and cheap labor too! 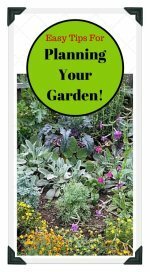 Vegetable gardening is a practical guide for young people and adults as well to ways of becoming self sufficient, responsible, and able to achieve set goals. A plentiful harvest is the handsome reward for a job well done!